It is officially Fall and we are all revved up for our upcoming events, corporate projects and much more! Something that is very important to us is doing what we can to ensure every school-aged child, within our reach, is fully equipped to succeed in the new school year. This was the motivation behind two of our recent initiatives - a Back to School Picnic and a Back to School Drive for the children of the over 40 locations that we support. In addition, donations from our always-generous Supporters (like you reading this!) made our month-long Back to School Drive a rousing success. While Back to School can be an exciting time of year, the truth is: it can also be a very expensive one. The ultimate goal of our "Buy a Backpack"-themed drive was to offset Back to School expenses by providing children with brand new backpacks filled with school supplies. When it comes to "Summertime in the City" staples such as baseball games, hotdogs, staycations and more likely come to mind. However, for the families who we help support, these luxuries aren't necessarily a priority or a possibility. Enter our friends at Con Edison who provided us with free New York Yankees tickets to send groups of children to baseball games. Needless to say, the outing was a fun highlight for many! 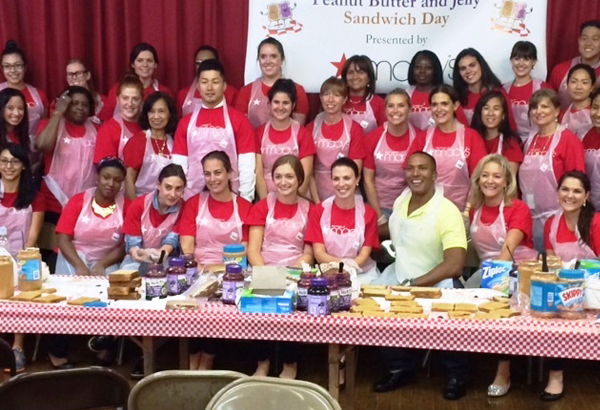 Mike Woods recently took time off from Fox 5 NY's Good Day New York to make Peanut Butter & Jelly Sandwiches for our food pantries and shelters. Teaming up with over 50 corporate volunteers from Macy's, he helped to prepare thousands of sandwiches for distribution throughout our network. With so many events and projects lined up in the near future, be sure to Connect With Us on our social media accounts to stay updated on our work and how you can help. Click to connect with us on: Facebook, Twitter and Instagram.